Gifts that get the adrenalin flowing have become hugely popular over the past few years and are now much more widely available at affordable prices than they used to be. It’s getting to the point where you’re considered a bit of a dullard unless you’ve hurled yourself off a mile-high bridge or careered down white water rapids. So if you know someone who would simply hate being considered boring or lacklustre an adrenalin gift is a definite must. Bungee jumping is one of the most well known and most popular adrenalin gifts available, but is by no means intended for the faint-hearted. It essentially involves falling 170 feet before swinging and bouncing from a giant bungee cord. It is a fantastic way of getting those adrenal glands working and can make a great gift for a friend or relative. For roughly £50 you can buy an open dated gift voucher which will be valid for about 10 months at various locations throughout the UK. Travelling at high speed on land is one thing, but with a constantly shifting ocean beneath you and a brisk sea breeze in your face it’s an entirely different experience altogether. Travelling at speeds of up to 60 mph in a 4-stroke series race boat is something every adrenalin junkie should get a kick out of, and now they can because the cost has dropped to less than £100 for a group of 4. The powerboat season runs from April until October and participants will receive a presentation certificate as a reminder of their exhilarating nautical experience. Know someone who’d like to plummet 2000 feet at 120mph before floating a further 5000 feet with nothing more than a few strings and a light-weight canopy preventing certain death? 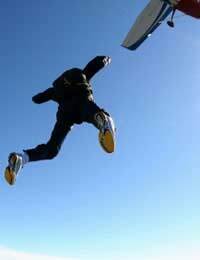 Then look no further for that ideal gift, because skydiving is the one for them. There are a range of options available; tandem skydives for one off jumps, two day courses for those who want to receive a qualification and even indoor skydives for the slightly less adventurous. Skydiving is not the cheapest of adrenalin experiences, but it is considered one of the most invigorating available and can make a superb gift. Sphereing is one of the lesser known and more unusual extreme sports that people are taking part in these days. It involves climbing inside a 12 foot inflatable ball and being rolled down a steep hill at speeds of up to 30 mph. Participants are strapped in safely and protected by a thick cushion of air from all those bumps and shunts that you tend to find when tumbling down a hillside in a giant beach ball. It might not seem like everyone’s cup of tea but it has been growing in popularity lately and can be a huge amount of fun for anyone not afraid of getting a little dizzy. This has to be the ultimate adrenalin gift and should not require a second thought for anyone with a spare £60,000. The sub-orbital spacecraft flies the lucky participant up to a height of over 62 miles above the earth’s surface giving the most spectacular view of our planet imaginable. When the craft gets to its maximum altitude, the engines are turned off and passengers will experience 5 minutes of total weightlessness. All sub-orbital flights are preceded by a detailed four-day flight preparation and training program and when passengers have completed their flight into space they will receive a lifetime membership of the Exeo-Atmosphere Club, reserved only for those who have taken part in a sub-orbital flight. Only a handful of people have signed up for this adrenaline experience so far, which isn’t surprising considering the price. However, if you’re lucky enough to be a billionaire software developer or oil tycoon, then someone you know could be one of those lucky few.